As the hunger strike approaches its 100th day on May 17, 100 prisoners are refusing food. Such cruelty breeds desperation. Last year, Adnan Latif was finally sent home to Yemen in a coffin after almost eleven years; he had ostensibly overdosed on pills. Since the hunger strike began, at least two men have attempted suicide. 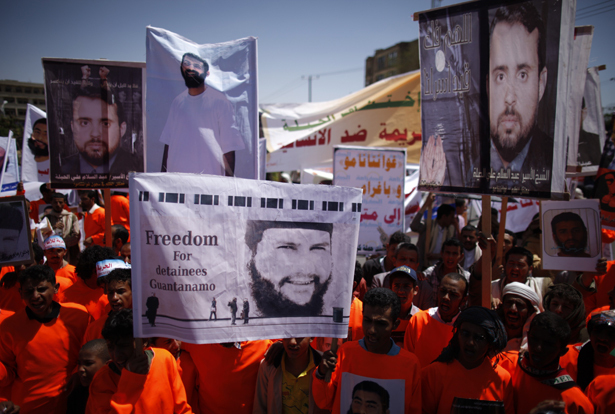 “I do not want to die here,” wrote Moqbel, “but until President Obama and Yemen’s president do something, that is what I risk every day.” On April 1, Yemeni protesters held posters of their imprisoned loved ones outside the US Embassy in Saana. The Pentagon, which once called prisoner suicides “asymmetric warfare,” has dismissed the hunger strike as a publicity stunt. Rather than “reward bad behavior,” the official response has been to throw the men into solitary confinement and keep the most weakened alive through torturous means. Moqbel described how eight members of the prison’s Extreme Reaction Force tied him to a hospital bed, forced an IV into his hand and left him there for twenty-six hours. More than twenty men are now slated for force-feeding, which means being strapped to a chair and having tubes carrying a liquid diet shoved into their noses. In late April, forty “medical reinforcements” arrived on the island to assist.